It’s 6am. Yet again I awake in a building that is shrouded in cloud. The sound of rain on the windowpane is like that of a knife cutting into my flesh. I’ve had enough of this. I just want to stay in bed and sleep. But for the twelfth day in a row I drag myself out, put on the porridge, and try to focus my befuddled brain on the task ahead. Think Mal… once you’re out there it’ll be OK. Think of why you are doing this; the importance of the cause. I try every trick I know but still I want to crawl back under my duvet and hide. I seek out Tom, eager to find out whether he can rejoin the quest today. One look at his face gives me the answer – it’s all pain and disappointment. I’m bummed for him and I’m bummed for me because right now I could really do with the company. It was all a little slow but eventually we got going. There were no theatrics, no big goodbyes with Tom, because we thought we’d catch up with him later in the day somewhere. We climbed into our Spaceship and headed west for the hour’s drive to Plymouth. As we drove the rain eased a little and a chink of brightness appeared in the western sky. Perhaps it was going to be okay after all? 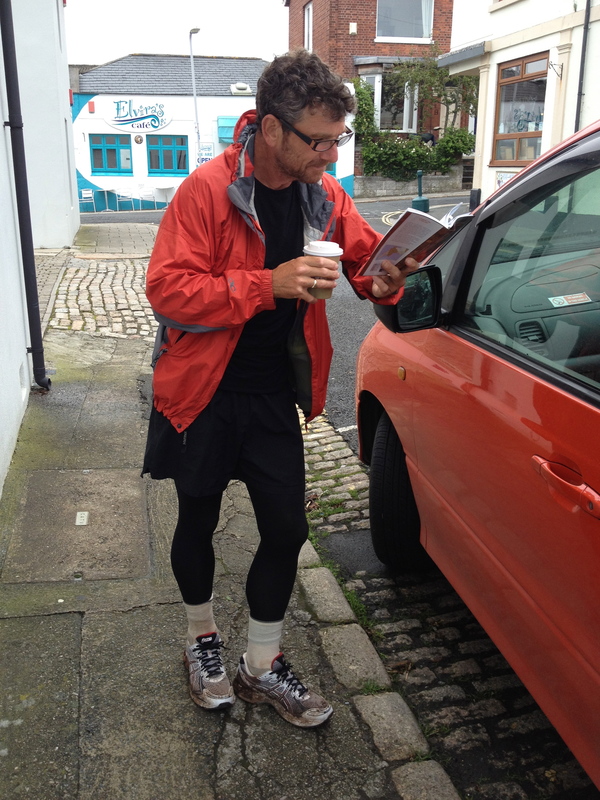 Studying the trail guide before heading off from Plymouth – a classic trail running image not! Or perhaps not. As I set off a light rain once again started falling. My plan was to walk the first couple of kms to get warmed up and then break into a jog. But straight away the pain from my shin was intense. It was close to unbearable. Dark thoughts crept into my mind as I crept around the historic waterfront. Was this the beginning of the end? If just walking was going to be this painful then what were my chances of knocking off another 350kms over just 6 days? I genuinely thought this might be my last day on the Path but I was determined that the end would not come in the middle of a big city. If it was to happen prematurely then it had to happen on a wild stretch of trail. I had to keep going if only to find somewhere more fitting to throw in the towel. In mournful mood I boarded the ferry across the harbour to Mount Batten. On the way I fell into conversation with a couple walking the Path who handed me a generous cash donation as we disembarked. It was a timely reminder of why I was doing this and my fear of letting people down resurfaced. Another good reason to just keep on plodding one step at a time. Maybe it was my endorphins kicking in or maybe it was a return to trail instead of tarmac, but before too long the pain receded to a more tolerable level – so long as I stuck to a walk. Any attempt at breaking into a jog was met with excruciating shots from ankle to knee. I resigned myself to the fact that this was now a walking mission, not a running mission. But 60kms a day walking! Could it be done, especially with the return of the big hills that I knew awaited me further east? For the moment I chose to shelve that question and concentrated instead on just putting one foot in front of the other. In a misty cliff top car park on the outskirts of Plymouth, I met up with Sal and the support van. I asked her to see if we could get some walking poles. They seemed to have helped Tom so perhaps they could do the same for me. 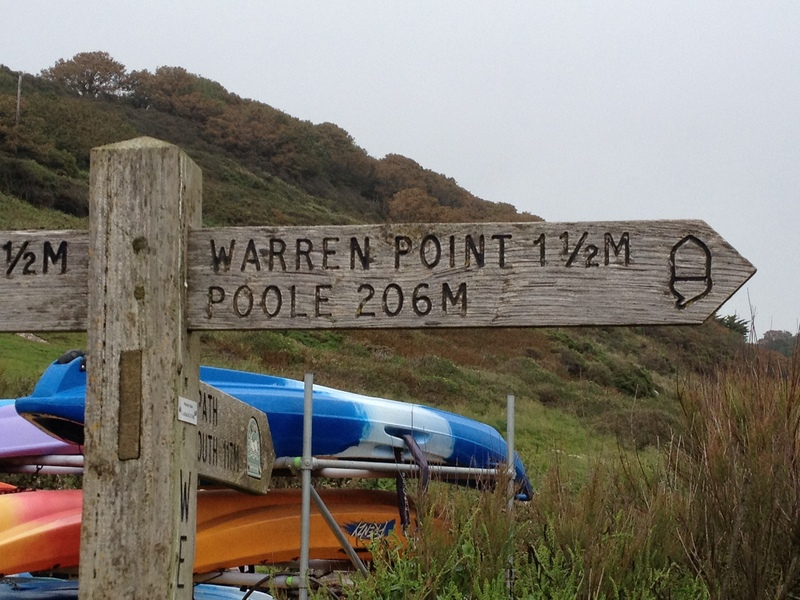 I trudged on around the coast toward Wembury, my foggy brain struggling with the simple arithmetic of how long I needed to walk each day to cover the required distance. The answer was at least 12 hours, so long as I could maintain 5kms per hour. It doesn’t sound much but with the fatigue, the injuries and the big hills that were still to come, it was a daunting prospect. Daunting but possible. And that’s all that mattered – it was POSSIBLE. This thought was a revelation and it immediately galvanized me. I walked around a corner in the track screaming “I can f***ing do this, I can f***ing do this” and was startled to confront the shocked face of a tweedy English lady out walking her spaniels. I mumbled an apology and carried on, a wry smile now adorning my haggard features. The River Yealm – I wish I could swim! Three hours into the day I reached the River Yealm, which needs to be crossed by a small ferry that only runs from 10am to midday. Had I been able to run I’d have made this comfortably but I’d missed it by 15 minutes. I hoped I might thumb a lift from a boatie with a dinghy but the only one in sight was rowing off into the distance oblivious to my cries. There was nothing for it but to backtrack 1km up a 100m high hill to rendezvous with Sal in the Spaceship and do the half hour drive around to the other side. More time lost, more frustrations. But at least the rain had stopped. 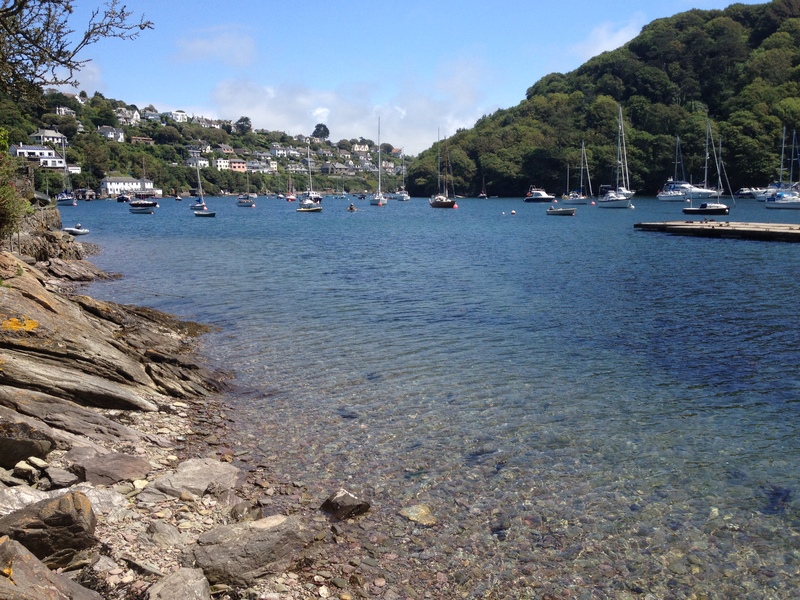 On the far side of the Yealm, in the picturesque village of Noss Mayo, I learned that Tom had gone home. I couldn’t blame him. Unable to continue it would have been purgatory to hang around. But I was a little upset not to have got to say goodbye. Still, there was talk of meeting up later at some point. The most pressing thing now for Tom though was to get some medical attention. Along with this news, I was presented with a brand new pair of walking poles. With a sigh of resignation I strapped these to my wrists and with Phil for company, set off on what was to be a lovely stretch of trail that after 15kms brought us to the next river crossing at Erme Mouth. This time the tide worked in our favour and the sun even graced us with its presence as we waded to the other side. 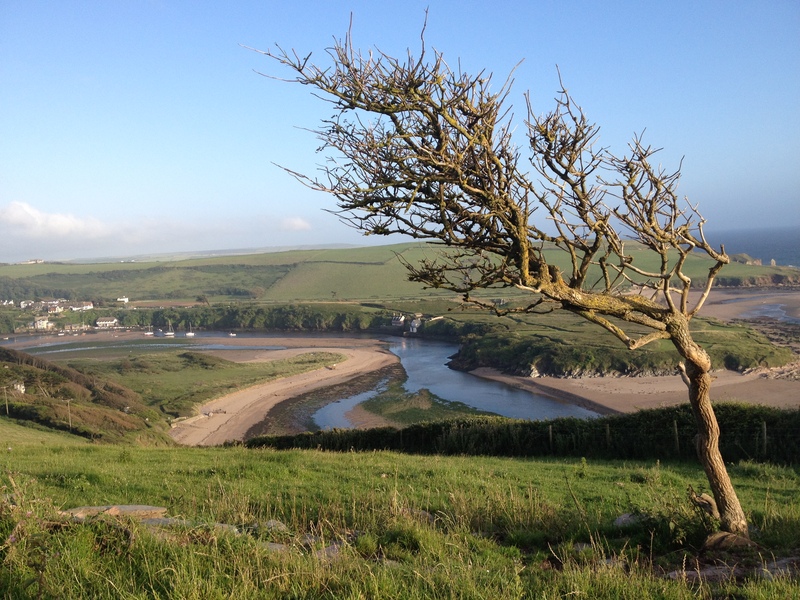 Another couple of hours on a very hilly section of the Path got us to Bigbury-on-Sea. It was about 7.30pm and I’d only covered 43kms. There was enough daylight to do more, but instead we decided on a slightly earlier finish so we could properly plan out the remaining days and revise our accommodation plans. For the first time in ages it felt like things were back under control and there was a clear plan for just how I could make it through. With a good meal and a cold beer inside me I went to bed a much happier chap than I had been for quite a while. The next morning – the 13th of the journey – I’m back on the trail by 7a.m. I’m a man with a mission. I want to bang out 5kms an hour and make it to Dartmouth, some 57kms and 2,000+ meteres of climb away, within 12 hours. Conditions are good and the scenery is spectacular. I’m getting used to my poles and finding I can use them to get some rhythm and tempo to my stride. My shin is painful but it’s manageable, dosed up as I am on Nurofen. But I’m coming to realise that walking long distances is every bit as hard as running long distances. If I were running this I’d be doing it well within my comfort zone pace, with time to look around and take photos. But to get through the required miles by walking I have to stay at the upper end of my speed threshold. I become obsessed with the pace, constantly looking at my GPS watch to see if I’m on target or not. This is not relaxed; it’s almost like a race. I’d rather be running. 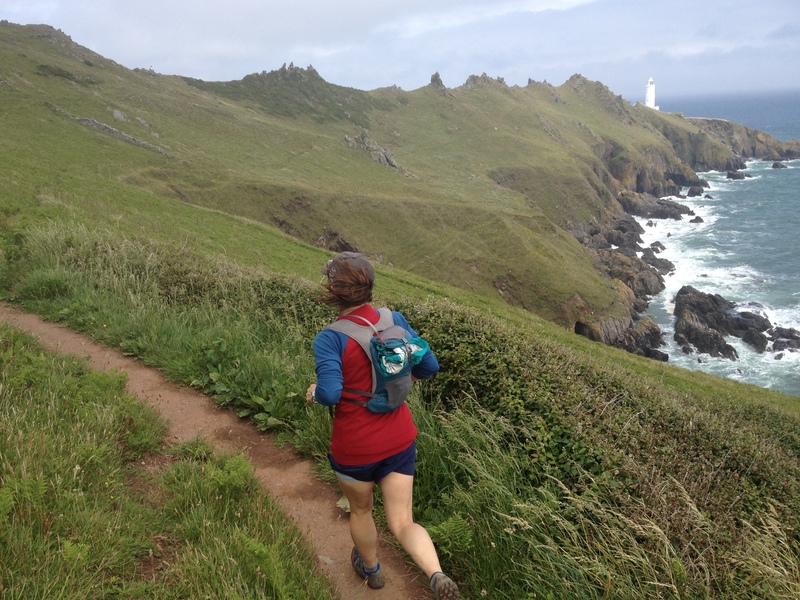 I reach Salcombe almost bang on target, the first 16kms covered in just over three hours. But I’m already feeling a little tired and am aware that I’m starting to get grumpy with support crew – and that’s never a good thing! A ferry takes Phil and I across this beautiful stretch of water and we pick up the Path on the other side. It’s good to have some company again and the kms tick away nicely with idle conversation and great views to help take my mind of the nagging pain. Sal shows how it’s done. Start Point lighthouse in background. Another couple of hours and we reach Lannacombe Beach where Sal takes over from Phil as my minder. 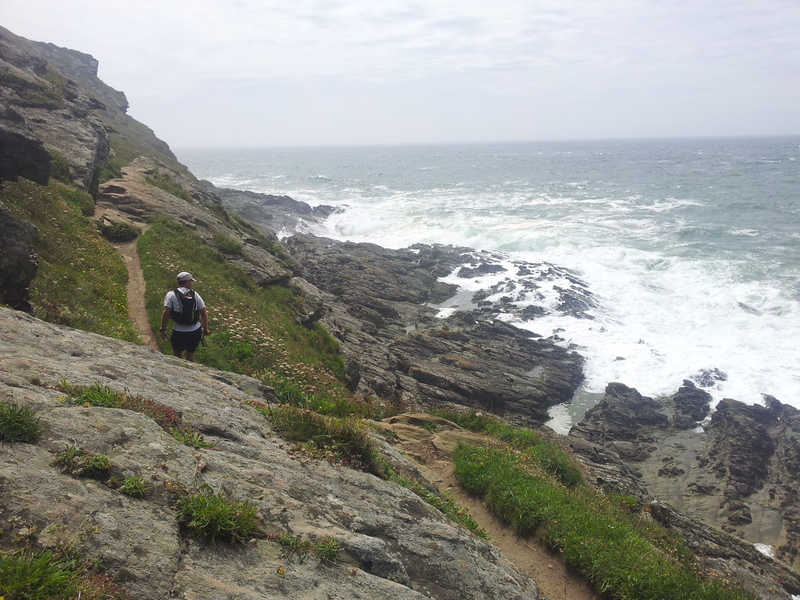 The weather is holding and the coastline is spectacular. I’m tired, struggling to keep up with the required pace as the trail becomes a bit more technical in places, but still it’s been a good day and all is going well. Then everything changes in an instant. Descending an innocuous set of steps I slip and a red hot shot of pain rips up my leg from my shin. It feels like I’ve just torn tendons from the bone. I lie at the side of the track in tears, struggling to find the will to get up and carry on. When I do finally move the pain is intense and I have to hobble the next 3kms or so to where Phil is meeting us at Torcross. Along the way Sal pulls a master stroke of motivational psychology… around her neck she wears a netball medal that was my mum’s from her school days in Paignton, the Devon seaside resort that we were scheduled to pass through the next day. Mum died last year and the medal came to Sal for safekeeping. She took this off, suggesting I might like to wear it for a while. I put it on and there it stayed for the next week. There was no immediate change in the pain but Sal had handed me a precious weapon to wage in my mental war. I had mum with me and I knew she’d be looking out for her boy. In Torcross I took time to ice my shin, rub in a liberal dose of Voltaren gel and knock back some more Nurofen. I was still some 15kms from Dartmouth but thankfully the next few kms were dead flat with the path running next to a lowland swamp. I set off again, still with Sal for company, but the pain remained unbearable. Every second step was agony and I really thought that the end was nigh. I could fight a certain level of pain, but this was too much. I figured I was now risking serious permanent injury if I stopped listening to what my body was so obviously trying to tell me – that it was time to throw in the towel. I sobbed as we walked, my head filling with negative thoughts of letting people down and being a failure. I wasn’t ready to give up, not totally, but the wise thing had to be to pull off the Path for today, rest up and try again tomorrow. I asked Sal to text Phil and get him to pick us up as soon as he could. Fortunately Phil didn’t get that text straight away. I wandered along, hand in hand with Sal, waiting for the bright orange of the Spaceship to pull up on the road which at this point ran adjacent to the Path. I wondered what was keeping Phil. Then something extraordinary happened… little by little the pain started to back off a bit. By the time Phil appeared it was almost back within the tolerable threshold and I told him I’d try another km or so. Fifteen minutes later and the pain was little more than a severe discomfort. I’ve no idea how or why this transformation came about, and I’m not a superstitious sort of bloke, but it’s perhaps no coincidence that my mum was a nurse! Phil later told me that this was the point when he realized that I really was going to make it all the way to Poole. I was not yet convinced but as we walked out the final couple of hours of that 13-hour day I was one mightily relieved man. I was still standing and ready to fight another day. Dunno about anybody else but I have goosebumps. Rock solid Mal. Stand proud! Y’know Mal, I didn’t think it was possible for a body to just keep going for 14 days. But I’ve watched you… when its a ‘personal’ run, you listen to your body, cheerfully. If its a run for a cause… you are mightily determined.. sheer bloody-minded: you don’t give in, no matter what!! In your words… “my fear of letting people down resurfaced”.. I was “determined the end would not come in the middle of a city [rather] it had to happen on a wild stretch of coast”. You have given the world so much. You have changed the way many of us think. You have made a difference, and a significant one.